Haven’t decided on a hotel yet? You can look at other available hotels in Amsterdam and North Holland with Booking.com. Dominated by the great city of Amsterdam, North Holland (Noord Holland) is filled with everything you imagine the Netherlands to be: delightful and lively towns, windmills, brilliant bulb fields, seafront hotels nestled in the sand dunes, and historic buildings. 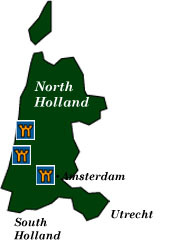 North Holland has always been the dominant economic force in the Netherlands from its ports that launched the voyages of the Dutch East India Company to its industry of the 21st century. Amsterdam Enormous cultural wealth, picturesque canals, and a tolerant lifestyle attract visitors to this world-class city. There’s still a small-town feeling, though, and its many attractions are easily reached. Where to start? Rijksmuseum After a ten-year renovation of this 19th-century Amsterdam landmark, you may once again view the finest art the Netherlands has to offer. Star attractions such as Rembrandt’s The Night Watch or Vermeer’s The Kitchen Maid, as well as superb sculpture and decorative arts, exhibits that relate the story of Dutch history, prints, and Asian arts can keep you busy for days. Van Gogh Museum Prepare for insane crowds who also want to marvel at The Potato Easters, The Yellow House in Arles, and Sunflowers. This collection holds some 200 paintings, 600 drawings, and over 800 letters of Vincent van Gogh—all acquired over the years by his younger brother, Theo. Stedelijk Museum is home to the National Museum of Modern Art. You’ll find here all the greats: Picasso, Mondriaan, Cezanne, Chagall, Monet, and Malevich. Rembrandthuis For twenty-one years, Rembrandt created some of his most memorable paintings in this house. Here you’ll find etchings, self-portraits, and landscapes. Joods Historisch Museum Four synagogues interconnect to rooms full of exhibitions and artifacts that relate the culture and history of the Jews in the Netherlands. Oude Kerk This 14th-century Gothic church is the oldest in the city. Check out the fragile 15th-century gilded vault paintings, the stained-glass windows in the Lady Chapel, and the Great Organ with its 54 gilded pipes. Waag This multi-turreted gatehouse was once part of the city’s 15th-century fortifications. By 1617, it was the main weigh house where peasants had their produce weighed and taxed. For three hundred years various guilds met here. It was also a spot for public executions. Oost-Indisch Huis Now part of the University of Amsterdam, for nearly 200 years the Dutch East India Company (also known as the VOC) used this building as its headquarters. You may walk around the exterior and inner courtyard, but the interior rooms are used by the university. Amsterdam Historisch Museum Learn about the development of Amsterdam as a small walled settlement to a major metropolis in this historical museum housed in a 16th-century converted orphanage. Koninklijk Paleis The Dutch royal family use this palace for official state occasions. Built in neo-classical style as a city hall, Napoleon’s brother, Louis, adopted it as his residence. Opulent interiors include inlaid marble floors, sculptures, chandeliers, and fine artwork. Begijnhof Probably one of the most peaceful spots in Amsterdam is at this 14th-century convent with its tiny houses and gardens. A Catholic order of unmarried or widowed women called the Beguines, who did not take monastic vows, once lived here. A house worthy of note is No. 34, the oldest wooden house in the Netherlands. Also, the Pilgrims worshipped at the 14th-century Engelse Kerk. Canals It may be the realm of tourists, but there’s not a better (or more delightful) way to explore the city. The entire canal ring area is now a UNESCO World Heritage Site. The Herengracht Canal is where the wealthy traders lived. Look for the different gables along the roof lines. The Keizersgracht, named after Holy Roman Emperor Maximilian, is the widest one and it’s where you’ll find the Museum Van Loon (below). The Prinsengracht, named after the Prince of Orange and built during the Golden Age, is the longest. On this canal, you’ll find the Anne Frank Huis. Anne Frank Huis This young Jewish girl, who gave a human face to the victims of Nazism, could never have imagined that she would become one of the most famous diarists of the world. Nearly one million visitors a year pay homage to her at the rear annex of the house where she and her family hid until discovered by the Gestapo in 1944. Museum Van Loon is a 17th-century elegant mansion that belonged to one of the most prestigious families in Amsterdam. Much of the original character has been restored, along with fine period furniture, sculpture, and wall paintings. Verzetsmuseum Established by former members of World War II’s Dutch resistance, you’ll find a fascinating collection of photographs, fake documents, and audio clips which describe the activities of those heroes who managed to hide 300,000 people from the Nazis. Scheepvaart Museum In the former arsenal of the Dutch navy, lovers of all things about ships can revel in exhibits about whaling, naval combat, maps, hundreds of ship models, a 19th-century gilded barge constructed for William I, and an East Indiaman. Science Center NEMO This green building designed in the shape of a ship is a great place to take kids for hands-on displays and experiments. They can learn about electromagnetism, build dams, and experience anti-gravity. On the roof you can enjoy stunning views of the port and city. Artis Amsterdam Zoo is the oldest in Europe. You’ll find themed habitats such as the tropical rainforest and the African savannah. A planetarium re-creates the night sky on its dome. The stand out exhibit is the aquarium with coral reefs, shark tanks, thousands of marine animals, and a canal from a fish’s point of view. Hermitage Amsterdam This satellite branch of Russia’s State Hermitage Museum in St. Petersburg presents temporary exhibitions from its fabulous collection. Haarlem The capital of North Holland may be visited as an easy day trip from Amsterdam, but if you feel like exchanging the urban bustle of that city, here you’ll find vibrant, pedestrian-only streets that pass by historic buildings, cafés and restaurants, small grocers, and antique shops. Around the tree-lined Grote Markt, a large 15th-century church, called the Grote Kerkvan St. Bavo, offers organ concerts on the same Müller organ—one of the most famous in the world—once played by Handel and Mozart (when he was ten years old). Frans Hals Museum A 17th-century almshouse is now a showcase for the masterpieces of this great Golden Age painter of the Haarlem School. Teylers Museum The oldest museum in the Netherlands was founded in 1778 by Pieter Teyler van der Hulst to promote science and art. The collection is a little eclectic from fossils, scientific instruments, and coins to drawings by Rembrandt, Michelangelo, and Raphael. Corrie Ten Boom House If you’ve read the book or seen the movie The Hiding Place, the home where it all happened is now a museum. During World War II, Corrie Ten Boom hid hundreds of Dutch resistance fighters and Jews in a secret compartment in her bedroom until she was betrayed to the Gestapo. Zuid-Kennemerland National Park If you feel like some fresh air, this national park (3,800 hectares/9,390 acres) is in the middle of some of the Netherlands famous sand dunes. Car parks are just outside the entrances, and from there you can use footpaths and cycling trails to get to the lookout points and bird observation hut. Spring is a great time to visit when flowers begin to bloom. Zaandam Russian Tsar Peter the Great came to the Netherlands, then considered one of the most advanced nations of the world, in disguise as a seaman to learn about shipbuilding in 1697. The Czaar-Peterhuisje is where he stayed. Nearby Zaanse Schans is a living museum where you can see beautifully restored structures from the area, working windmills, and traditional crafts demonstrations. Edam On Saturday mornings during the summer months a kaasmarkt, or cheese market, attracts locals and visitors alike. Check out the old Kaaswaag, or cheese weigh house next to the market. Climb the tower in the nearby Grote Kerk for a terrific view and take time to admire the church’s fine 17th-century stained-glass windows. De Beemsterpolder This area of reclaimed land has retained its network of roads, canals, dykes, and fields all laid out to the principles of classical and Renaissance planning. For this reason, the area has been declared a UNESCO World Heritage Site. Enkhuizen This former fishing village now attracts visitors for its renowned Zuiderzeemuseum complex. This museum is in two parts. The first is the Binnenmuseum, or indoor museum, which consists of twelve buildings—some of which once belonged to the Dutch East India Company. Maps, paintings, and a collection of fourteen historic ships tell the story of the whaling and fishing industry and the construction of dykes. The nearby Peperhuis is a beautifully restored Dutch shipping merchant’s former home that still retains a hint of pepper in the air. The second part of the museum is the Buitenmuseum, or open air museum. More than 130 perfectly reconstructed houses and workshops evoke life from centuries ago with as much authenticity as possible. It’s a great place for kids. Alkmaar This historical town (the first to repel the invading Spanish in 1573) is famous for its traditional cheese market, held every Friday morning from the beginning of April through August. The cheese arrives on barges and is transported by members of the 400-year-old cheese guild on sledges to the waag, or weigh-house. Nationaal Biermuseum De Boom can be found in a 17th-century brewery. Here you may learn about beer making and drinking in the Netherlands across the years. Finish your tour at the tasting house. Stedelijk Museum holds paintings by Dutch masters and interesting collections pertaining to the history of the town. Naarden The town’s fantastic fortifications are shaped in a 12-pointed star with arrowheads at the tip of each point. This is all surrounded by a ring of two walls and two canals. Only from the air, unfortunately, do you get the full effect. Some of the pillboxes on one of the six bastions has been turned into a fortress museum, called the Vestigingmuseum. Collections of weapons, uniforms, and drawings relate the town’s history. Texel is the largest and southernmost island of the West Frisian Islands. Mostly given over to tourism these days, the island once played an important role in the passage of Dutch East India company ships. Now people come here to relax in charming villages and stroll through nature reserves (Naational Park Duinen Van Texel) and on broad beaches. Ecomare is an island nature center that educates visitors about Texel’s wildlife and development. Here, you’ll find nature trails, a large aquarium, and a refuge for sick seals and birds. At the Maritiem en Jutters Museum (The Maritime and Beach combing Museum), you can view all the oddball treasures found at the beach and recovered from shipwrecks. Displays cover underwater archaeology and rescue operations. On occasion are demonstrations by blacksmiths and rope makers.